Hand built in the USA with only the very best parts, motors, and wire. These heaters are not constructed of snap together plastic, and cheap internal parts. These heaters are designed to last you a lifetime, not a season. Heaters will work in any vehicle with a 24 Volt DC electrical system including trucks, Excavator, heavy equipment, etc. Totally electric ducted cabin heater. No engine hoses or water needed! INSTANT HEAT, INSTANT DEFROST. NO warm up time! Also available in 12, 36, or 48 Volts. Measuring only 9" x 5" x 4" means it will fit into tight spaces. The ducted heater is available with 2,3, or 4 vent outlets and can be configured virtually any way you would like. This heater features a High and Low heat settings and adjustable fan speeds. These new heaters are based on the proven Stealth series, but with a newly designed brushless high static pressure fan. The brushless design has proven to work well with sensitive electronics found in some of todays equipment. The brushless design has proven to have very little EMI noise when tested on a scope. These ducted heaters is your answer for an effective way to install a heat source quickly and easily. No water lines to run, fittings to install or worry about a corroded core down the road, and most importantly INSTANT HEAT. No warm up time! These ducted heaters are available from 12-48 volts and different wattages as well. These ducted heaters are simple to install and the vents only take minutes to mount. If you have a need for a defrost vent, a forward facing vent, or even a foot warmer, these ducted heaters are your answer. 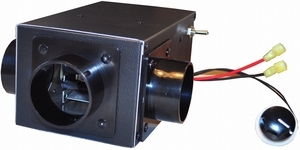 Measuring only 9" long and 6" tall, our ducted heater will fit in virtually any small space. These 24 volt heaters feature RuCar elements which have been tested to have a life expectancy of 10,000 hours, are vacuum sealed, and are exclusive to these heaters. Two year parts and labor warranty. Comes complete with mounting bracket, hardware, crimp on electrical ends, fuse, and fuse holder. Hoses and vents sold separately. Heater Dimensions: 9"x 5"x 4"
10,000 Hour RuCar Vacuum Sealed Heating Elements.